Tibet — The Hidden World! Tibet: A Trekkers and Travelers Hidden World! 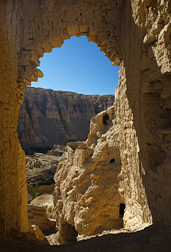 Tibet avoided most of the commercial influences of the western world and has remained a hidden world for many centuries. 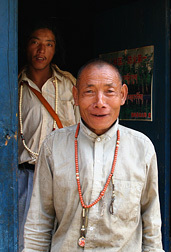 Since it was governed by its Buddhist spiritual leaders, monasteries became the culture's center in every respect. The high regard for them is mirrored by their sheer size, numbers and magnificence. Though many disappeared during China's cultural revolution, the ones that remain give us a glimpse of what once was. Tibetan Buddhism incorporates many of the elements of the older religion, "Bon Po," which worshiped the natural elements of sky, moon, sun, fire and soil. Monasteries and pilgrimage routes are often swarming with pilgrims as they travel great distances in fulfillment of their Buddhist vows. Tibet is wide and vast. 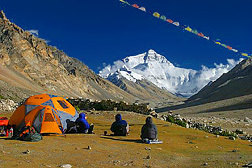 The logistics of touring as well as trekking are more complicated than in many neighboring countries. The late photographer, Galen Rowell, said it best — "If you are trying to decide between a vacation at Club Med and going to Tibet, then by all means go to Club Med... but if you are burning with a passion to see the country and the people then go." There are three primary entry points for Tibet visitors, each one with its benefits. There are direct flights from Kathmandu, Nepal as well as daily flights from Chengdu and Beijing, China. The flight to Lhasa from Kathmandu is often preferable because the change in altitude is not as drastic as when you arrive from Chinese cities which are often much lower. Kathmandu is a much different culture and location, so it's a unique spot to explore after a long Tibet trip. Driving from Kathmandu is an option as is the new train line from Beijing — both are difficult with high passes to cross before reaching Lhasa. It's often better to take an overland route as a return departing Tibet — by road descending to Nepal or rail back to Beijing. We suggest flying into Lhasa to spend your first few days to acclimatize to the high altitude, while touring the many local sites (and sights) of interest there. After a few days to normalize, you're ready to head to the mountains! 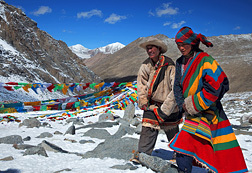 Tibet offers an amazing array of trekking options. Short or very long trips can lift you to staggering heights in the Himalaya. Treks can be oriented to see the best of the natural world or to follow in the steps of the Buddhist pilgrims to sacred mountains and secluded monasteries. A famous pilgrimage trek reaches and encircles Mount Kailash (offered as an HHT small group Scheduled Trek in September). This trek is a special destination during the time of "Saka Dawa," a Buddhist holiday celebrating Lord Buddha's birth, enlightenment and death. Celebrated during the full moon of late May or early June, you can observe scores of pilgrims as they amble the high trail around the holy mountain. Another cultural trek connects Ganden to Samye — both areas hold famous monasteries. This trail takes about five days and combines two important historical destinations with a beautiful high altitude hike. Also popular with HHT trekkers is the Tibet trail reaching famous Everest Base Camp, via Rombok Monastery. There are many possible routes through this area, depending on how high you'd like to go! Unless you are inclined to carry all the necessary gear yourself (backpacking solo), trekking in Tibet requires a practical minimum of three hikers — all food and gear must be transported by vehicle to the trailhead from Lhasa and later will be carried by Yaks along the rocky trails. 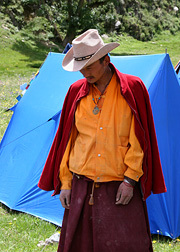 Our Custom Tibet Treks are also outfitted with a guide and cook. With a large group or long trip, a larger team may join the group to aid in support. Tibet's trekking season is often short because of the extremely high altitude. High altitude treks like Mount Kailash are desirable in June or September when weather and trail conditions are at their best. May and October are also possible, but will be much colder at night. Travel in summertime is possible too, but rain can often cause delays and washouts along roads and trails. In Tibet, food choices are often limited and most foreign visitors find what's available to be quite a change from their usual fare. 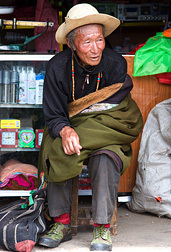 Tibetans traditionally lived on a steady diet of Yak meat, barley ("tsampa") and salty yak–butter tea. Don't worry, we can improve on those limited options for you, but if you are a vegetarian or have important diet limitations be sure to tell us early. Carrying 'energy' bars and treats can also help add variety! 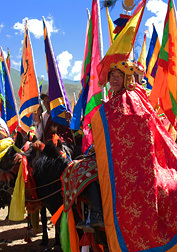 As you travel in Tibet, you will begin to see the unique aspects to its culture. Art, literature, and music all contain elements of Buddhist religion, and Buddhism itself has adopted a unique form in Tibet. Buddhism has exerted a particularly strong influence on Tibetan culture since its introduction. Tibet is flavored with many influences. It's specific geographic and climactic conditions (altitude, short growing season, and cold weather) created a reliance on the simple farming or barley livestock, creating a different cuisine from neighboring areas too. Tsampa (roasted barley flour) is sometimes called the national food of Tibet. Drinking Yak–butter tea is a regular part of Tibetan life. 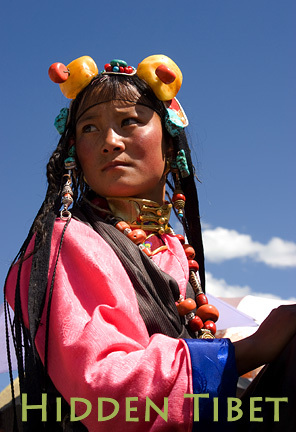 Contact with India, China, and Mongolia influenced the development of Tibetan culture, but the Himalayan region's remoteness and inaccessibility have preserved unique, local ways. Standing at 384 feet in height and 1181 feet wide in Lhasa, the famous Potala Palace was designated as a World Heritage Site in 1994 (later including Norbulingka in 2001). 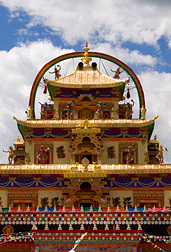 It is often considered a most important example and icon of Tibetan architecture. Formerly the residence of the Dalai Lama, it contains over a thousand rooms within thirteen stories, and houses portraits of the past Dalai Lamas and statues of the Buddha. It's a visit you can't miss. With each passing year, more Chinese visit Tibet as domestic tourists. Tibet's heritage as a 'hidden world' may soon draw to a close with a new flood of tourists discovering Tibet via the rail line from China's mainland as well as new, improved roadways. "Progress" is arriving in Tibet and the secret is out! While helping move goods and tourists into Tibet, this rail line will unquestionably alter the face of the country, bringing goods and travelers from afar. The time to experience this "hidden world" is now. Significant changes have already begun. The Chinese have begun an extensive road system in Tibet and many interesting cultural sites can now be visited with short walks or day hikes from stops along the road. In Lhasa you can find comfortable hotels run by local Tibetan families. Outside the city, many hotels are operated by the Chinese and can be less amiable and locally–flavored. A thermos of hot water is always provided in Tibet hotel rooms but rooms don't always have the same hotel standards or western–styled bathrooms we are accustomed to. If you are not a trekker but plan instead to explore by road, any time of year can be a good time to discover Tibet. Some HHT travelers have visited Tibet during the dead of winter for a unique and enjoyable experience! Hotels in major cities and towns have heating, while wood stoves are commonly used in the countryside. Heated all–road vehicles are available and Tibet's winters aren't too cold. The high altitude in this alpine desert means the snow doesn't get so deep as to seriously dampen travel plans on major roadways! Many visitors are tempted to experience the unforgettable Lhasa (Qingzang) Railway. It's a journey from near sea level in Beijing to Lhasa at 11,450 feet — a two–day rail ride you will long remember! The total length of Qingzang Railway is 1215 miles. Construction of the 506 mile section between Xining and Golmud was completed by 1984. The 709 mile section between Golmud and Lhasa was inaugurated on July 1, 2006 by Chinese president Hu Jintao. This railway is the first to connect the China mainland to the Tibet Autonomous Region. 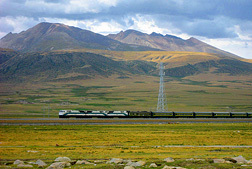 Due to its altitude and terrain, Tibet only recently had this conventional railway connection from the outside world. 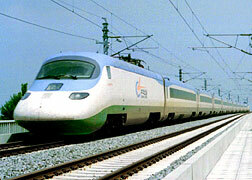 Passenger trains run from Beijing, Chengdu, Chongqing, Guangzhou, Shanghai, Xining and Lanzhou. The rail line reached Tanggula Pass, which, at 16,640 feet above sea level, is the world's highest rail track. The 4,390 foot Fenghuoshan Tunnel is the highest rail tunnel in the world at 16,092 feet above sea level. More than 597 miles, or over 80% of the Golmud-Lhasa section, is at an altitude of more than 13,123 feet. There are 675 bridges, totaling 99 miles, and about 342 miles of the railway is laid on permafrost. Initially, the swift trip with it's significant altitude difference caused problems — giving some passengers altitude sickness from the abrupt change. To help moderate this, extra oxygen is added to the train's ventilation system and personal oxygen masks are available. We suggest the best idea is flying into Lhasa, where you can slowly and safely acclimatize in a few days of sightseeing. Then tour or trek in Tibet and later, enjoy the train ride comfortably and more–safely back to lower ground. It's a fun and unusual experience and certainly the ride of your life! Items you'll likely see when you travel in Tibet include statues, religious items, Tibetan rugs and carpets, silver jewelry, thankas, hats, bags, wooden items, masks, incense and decorative items. For those interested in hand–made local art, the disappointment is that most of what you'll see in Lhasa is often produced in Nepal, India or China. Unless you discover a local artisan at work, save your money (unless you really like the piece) as it likely came from elsewhere! Tourism brings in the most income from the sale of craft souvenirs and it's worth being watchful for a genuine local Tibetan artist at work and supporting them. 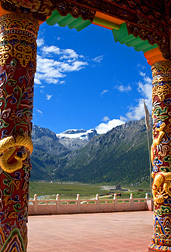 The best enhancement for your trip is to learn about Tibet's culture and history before you go. Tibetan history is focused on the history of Buddhism there. This is partly due to the central role Buddhism has played in its culture and also because most native historians of the country were Buddhist monks. Religion is extremely important to the Tibetans with a strong influence over all aspects of life. Tibetan Buddhism is the symbol of Tibet and it's signs are everywhere. But Muslims have also lived in Tibet since as early as the eighth or ninth century and Christians arrived from Europe in the 17th and 18th centuries. 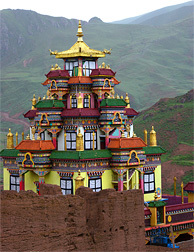 Tibetan architecture displays Oriental and Indian influences but reflects a deeply Buddhist flavor. Tibetan music is primarily religious music, reflecting the profound influence of Tibetan Buddhism on the culture. Tibetan festivals such as Losar, Shoton, and the Bathing Festival are deeply rooted in religion and also contain foreign influences. Each person takes part in the Bathing Festival three times: at birth, at marriage, and at death. 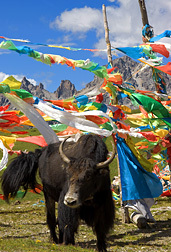 Tibetan festivals are a main source of entertainment and can include many sports such as yak racing! Custom Trips are unique by definition. It can seem to be an overwhelming prospect for you to design a Custom Tibet trip that becomes a rewarding, once–in–a–lifetime success... and that is where we come in. Our long experience (since 1988) gives us a local familiarity with Tibet, combined with our network of local staff that you just won't find elsewhere. There can be important preparations needed to successfully enter and travel in Tibet, so understanding the formalities becomes important — experience matters!. Dozens of travelers explore Tibet with us each year and you can too. There are many options to keep your trip unique, affordable, enriching and safe. Once you have the ideas for your Tibet trip, contact us to turn them into the adventure of your life. Plan early for an carefree experience.